Aah. The school lunch box. What's in it today? The school lunch box is a tricky thing you see, especially when schools are "nut-free" and all my girls just really want for is anything with Nutella. Either that, or they'd rather have rice with anything (even hotdogs) than a ham and cheese sandwich. Yes, I have raised them well into the Filipino food culture. Sometimes I get organised and prep the lunches in the evenings and then get that extra few minutes of sleep in the mornings. Most of the time, I open the fridge door in the morning and prep what's on offer. Sometimes its a jam sandwich, or a cup of rice with what's left over from dinner, at odd times the girls will have some onigiri because I felt like I had superpowers for the day. I drool at lunch box bento boxes prepared by other mums who I follow on IG like Nami from Just One Cookbook. I want to, but at the same time, I don't. Hahaha! With 4 girls going back to school, I don't think I have enough superpowers to do them all equally attractive and bento-box like. While I don't prepare bento-box like lunchboxes, I do love going back to their favourites and adapting them to the school's nut-free policy. This is a favourite brownie recipe with the nuts replaced with Oreos. Now who doesn't love Oreos? 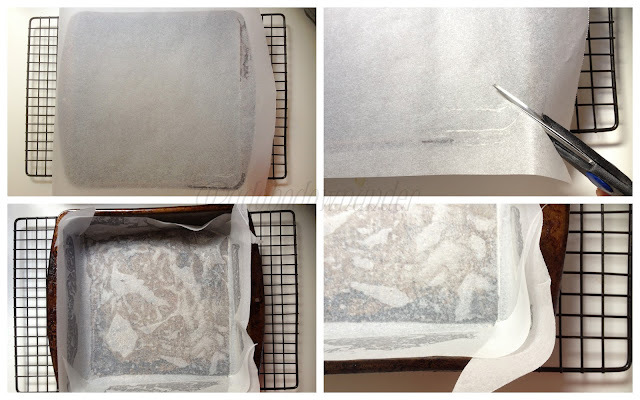 Pre-heat over to 180 degrees C. Line a 28cm X 18cm brownie pan with non stick baking paper. Put the chocolate and butter into a heatproof bowl and place over a saucepan of simmering water, stirring occasionally until smooth. Remove the bowl from the heat and set aside to cool slightly, 5-10 minutes. Combine the sugar, flour, cocoa powder and Oreos in a large bowl. Using a wooden spoon, stir in the eggs and chocolate mixture until just combined. Pour into the prepared pan, and top with the mini Oreos (as many or as little as you want) slightly pushing them into the batter. Bake for 30-45 minutes, or until moist crumbs cling to a skewer when inserted into the centre. * Brownies are very versatile. You can add any kind of nuts or leave them plain. * Instead of Oreos, you can also top them with salted pretzels, Ferrero Rochers, Reese's cups - which I've seen from IG feeds. * Here's another tip I learned from TAFE when lining square pans. Cut the edges diagonally, and then slid them side by side to fit the pan. No need to cut a square and line the sides. And so 7 weeks more before the next school holiday, but I'm not counting. While I surrender back to the chaos and regularity that is our life, I also love sitting back and enjoying the peace and quiet when I'm not working and have the day to myself - which days have been filled with physical activity: walking and badminton and yes, more time in the kitchen to cook and bake. Now, what's for the lunch box tomorrow? ohhhhhh man oreo brownies! why have i never thought of that! looks incredible! when do you add the oreos on top? after you've poured the batter into the pan and just before you put in oven? halfway through baking? or right at the end?